Welcome to Lapointe Fish Limited, a name to trust for quality fresh fish and seafood. Since 1867, our commitment to quality, knowledge of the product, and customer service is what has made Lapointe Fish a house hold name in the Ottawa-Carleton, Gatineau region. Lapointe Fish Ltd. has been owned and operated by the Vivian family for over a hundred and forty years and is now currently being run by the third generation, who grew up watching their grandfather and fathers run a fresh fish business. 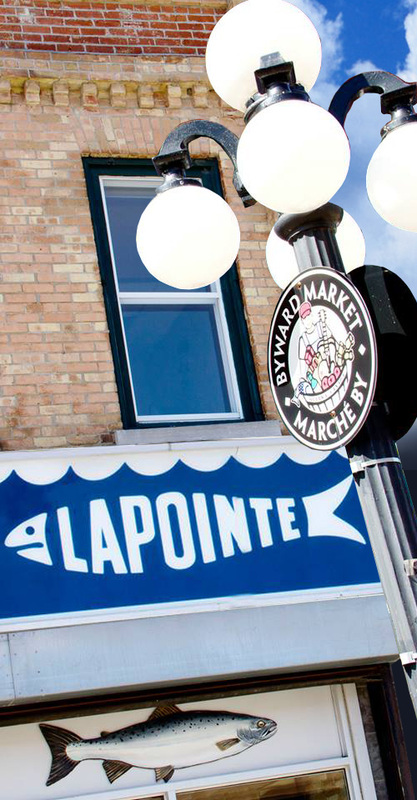 When Eric Vivian Sr. bought Lapointe Fish Ltd in 1965, there was only a sole retail shop on the ByWard Market. Over forty years later, Lapointe Fish has expanded to offer Ottawa residents numerous seafood grills and retail stores, sushi counters, and wholesale services all over the region of Ottawa. It is our belief that our continued commitment to ensure quality product, service and knowledge has led to the continued patronage of our loyal customers. Whether you would like to purchase some fish to cook at home or treat yourself out for an intimate dinner at one of our grills, Lapointe is your headquarters for quality fresh fish and seafood. In the mood for sushi? Lapointe offers daily made sushi at various locations across the Ottawa/Gatineau region as well as sushi-grade product if you feel like making your own sushi at home! We are also pleased to offer catering and wholesale services to the greater Ottawa / Gatineau region. Only the best will do at Lapointe Fish!